« Rainbows Are Getting Pretty! Still more of the same in weather. Mid 90s, low 90s, maybe upper 80s through early next week. Looks like a little warm up toward the middle of the week. Still a slight chance of rain on Monday. Generation fairly stable. Worst thing that happens is that they fire it up an hour or so earlier than the projections. Today was even earlier, but they only started with one. Still fishable in many places. rise. The Louisiana Kerrs were on the water all day yesterday with Darrell and Stan. Darrell had Albert and James Albert and they probably did best on the red San Juan Worm. Stan had Dawn, aka “The Stripper”. Give her something to strip, in this case it was a size 12 holographic green crackleback and she’s catching fish. Stan was trying to revive one of the fish she had just caught when she hooked this one on her 4 weight Trout Bum. Gave her a bit of a fight on that rod! They also caught fish on the ruby, primrose & pearl, and the size 16 red midge when the water came on. 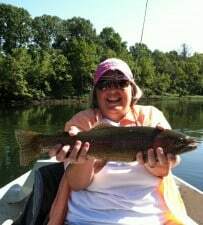 This entry was posted on Saturday, August 27th, 2011 at 1:19 pm	and is filed under Fishing Reports. You can follow any responses to this entry through the RSS 2.0 feed. You can leave a response, or trackback from your own site.